An unusually strong El Nino pattern this year is reportedly linked to a ‘deadly red tide’ in Chile. The implication is that sea temperature anomalies are causing an algal bloom which renders fish and shell fish poisonous to eat. Fishermen in Los Lagos are protesting that their government is not doing enough to mitigate the event. 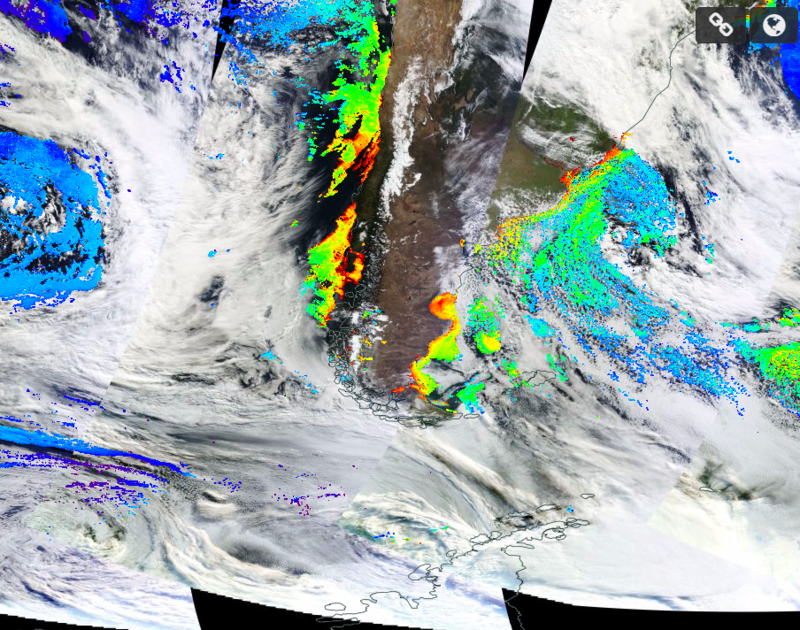 MODIS Aqua imagery presented by NASA can be analysed for Chlorophyll concentration, see featured image above (chlorophyll by MODIS Aqua 26 Apr 16). The oranges and reds indicate high chlorophyll level with blues lower. Such analysis is only possible in cloud free skies. Unfortunately the great southern ocean makes a ready supply of the white puffy stuff and I had to go back a couple of days to get a break in the canopy to get this image. El Nino is one of the three stages in the El Nino-Southern Oscillation (ENSO). El Nino is a warm anomaly, La Nina is a cold anomaly and the third stage is neutral. The National Weather Service sea surface temperature is included below for information. Cold up welling along the coast of Chile is a usual part of the ocean circulation and brings nutrients which feed marine life. A warm anomaly suppresses this effect and is bad news for communities reliant on the sea for food. The warm anomaly along the coast of South America shows up in yellows and oranges.